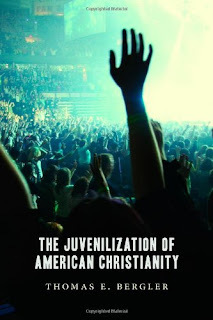 Juvenilization tends to create a self-centered, emotionally driven, and intellectually empty faith. As the line between adolescence and adulthood continues to blur, eliminating youth ministries would only weaken religious formation of youth without doing much to counter spiritual immaturity among adults. And instead of naively thinking we can eliminate juvenilization, we should instead work to tame it by helping local congregations build an intergenerational way of life that fosters spiritual maturity. Pastors and youth leaders can begin by teaching what the Bible says about spiritual maturity, with a special emphasis on those elements that are neglected by juvenilized Christians. Church leaders also need to ask hard questions about the music they sing, the curriculum materials they use, and the ways they structure activities. We need to ditch the false belief that cultural forms are neutral. Every enculturation of Christianity highlights some elements of the faith and obscures others. We must be vigilant and creatively compensate for what gets lost in translation when we use the language of youth culture. For example, if we sing songs that highlight the emotional consolations of the faith, what can we do to help young people also embrace the sufferings that come with following Jesus? I believe one key is to renew our commitment to the church as an intergenerational family, in which each person has a unique role in helping the others toward our shared goal of maturity in Christ (Titus 2:1-15; Eph. 5:21-6:4; Col. 3:18-4:1; 1 John 2:12-14). Adults need children and adolescents to draw out their committed love and provide concrete opportunities to care for others. Adolescents help adults reconnect with the passion of a life devoted to Christ, what he called the first love of the Christians at Ephesus (Rev. 2:4). Young people need adults in their lives who are modeling a vibrant spiritual maturity. One reason no one wants to grow up in America is that many adults don't make their life stage look very attractive. Teenagers can legitimately follow Christ in adolescent ways, including participating in age-appropriate youth ministries. But those ministries must also help youth catch a vision for growing up spiritually. Churches full of people who are building each other up toward spiritual maturity are not only the best antidote to the juvenilization of American Christianity, but also a powerful countercultural witness in a juvenilized society.